Much of the talk about ending workplace discrimination focuses on gateways — that is, what happens after a woman or a minority candidate applies to college or sends in a resume for a particular job. But some of the biggest barriers to a truly diverse applicant pool and workforce may actually be occurring at the stage just before that — what Wharton operations and information management professor Katherine Milkman and collaborators Modupe Akinola of Columbia University and Dolly Chugh of New York University call the “pathway” stage. If women or minorities are not given the same level of encouragement — or the same ability to access “insider” information — as their white male colleagues, they may be discouraged from even trying to pursue a particular opportunity, or they may start the application process at such a disadvantage that there is no chance of catching up. In two recent papers, Milkman, Akinola and Chugh examine how this type of discrimination plays out in the world of academia. Using an experiment that explored the treatment of prospective applicants to doctoral programs, they found that professors were significantly less likely to be responsive to communication from women or minority applicants — and that the level of unresponsiveness was greater within academic disciplines that tend to pay more, and at private institutions, where faculty salaries are higher on average. The papers, Heterogeneity in Discrimination? 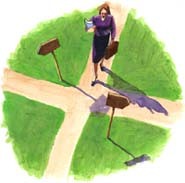 A Field Experiment, and one published in the journal Psychological Science titled, Temporal Distance and Discrimination: An Audit Study in Academia, were inspired in part by Milkman’s personal experience as one of just a few female PhD students spending time in the computer science and economics departments at Harvard. She also points to an enlightening study by Harvard economist Sendhil Mullainathan and University of Chicago economist Marianne Bertrand, who in 2004 explored race and gender biases in hiring by sending out resumes in response to ads for entry-level jobs in Boston and Chicago. The resumes were identical except for the candidate’s name, which was designed to indicate the applicant’s race and gender. Bertrand and Mullainathan found that white job candidates received a 50% higher callback rate for interviews than identical black job candidates. Milkman and her co-authors designed an experiment in which they sent e-mails to 6,500 professors at 258 U.S. universities representing 89 different disciplines. All of the e-mails contained meeting requests from prospective doctoral students. But the names of the fictional prospective students were randomly varied to indicate whether the sender was a man or a woman, or if he or she was white, black, Hispanic, Indian or Chinese. In some of the requests, the student asked if he or she could come in for a meeting that same day; others asked to meet in a week. Indeed, the researchers found that there was virtually no difference in the rate of response when prospective students asked for an immediate meeting. But when they tried to schedule one in a week, white males were 26% more likely to successfully schedule a meeting and 16% more likely to receive a response. While white males were more likely to get a response if they asked to meet in a week rather than the same day, female and minority students had a better response rate when they asked to meet immediately. The response rate for women and minorities was 14 percentage points higher at public institutions than at private schools. Further, a $13,000 increase in a faculty member’s salary was associated with a four percentage point drop in the email response rate to women and minorities, but faculty salary had no such effect on white males. All faculty members who responded “yes” to the meeting requests got an e-mail minutes later saying the student couldn’t make it. All were sent messages two weeks after the experiment telling them that the queries were part of a study. Reactions were mixed. While some thanked the researchers for examining the issue of discrimination, others were upset because they felt the methods used were intrusive and wasted their time.